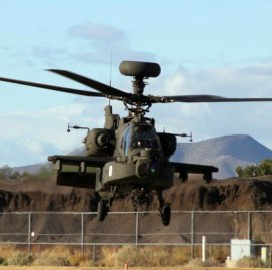 The State Department has approved Kuwait’s request to buy advanced medium range air-to-air missiles and logistics support for Boeing-built (NYSE: BA) AH-64D Apache helicopters under a pair of foreign military sales agreements worth approximately $510 million combined. Kuwait requested to procure contractor logistics and sustainment support services for Apaches, as well as simulators, wheeled vehicles, spare and repair parts, test equipment, training equipment and services and technical support under a potential $400 million FMS contract, the Defense Security Cooperation Agency said Monday. Boeing, Lockheed Martin (NYSE: LMT), DynCorp International and Longbow Ltd. – a joint venture of Lockheed and Northrop Grumman (NYSE: NOC) – will serve as contractors for the transaction that seeks to help Kuwait perform joint exercises with the U.S. military and protect its border. Kuwait also asked to purchase 60 Raytheon-made (NYSE: RTN) AIM-120C-7 AMRAAM missiles, containers and related services through a separate contract valued at $110 million. Raytheon will act as the prime contractor for the FMS deal that seeks to increase Kuwait’s interoperability with the U.S. and provide sustained air-to-air capability for the Middle Eastern country’s F/A-18 fighter aircraft.